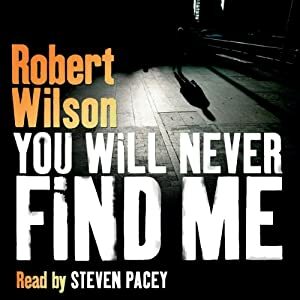 Steven Pacey reads the next in Robert Wilson‘s Charles Boxer mysteries, You Will Never Find Me. Due to be released 13 February 2014. Charlie Boxer messed up his family life. First the army, then the police, then high-stakes kidnap and recovery, his ex-wife and daughter learnt to live without him as his work took him places no man can come back from unscarred. Trying to rebuild a relationship with Amy, his teenage daughter, hasn’t been easy. But Charlie only realises just how wrong things have gone when he finds her empty room and a note: You will never find me. Having spent years working to track down kidnap victims, Charlie knows that sometimes, the missing don’t want to be found. And he knows the hell it brings for families – the vanished are neither dead or alive, but simply gone. Worse still, Charlie Boxer knows how quickly a life can fall apart once you’re living under the radar. For Charlie, danger has finally come to his front door and to crack the hardest case he’s ever worked, it’s time to face up to the true meaning of the sins of the father.